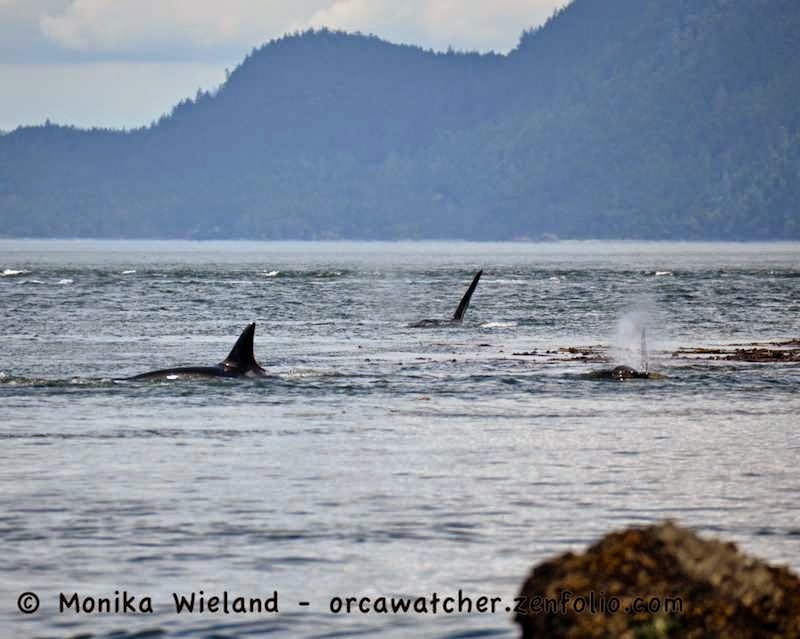 Orca Watcher: June 24th: Spieden Channel Residents! 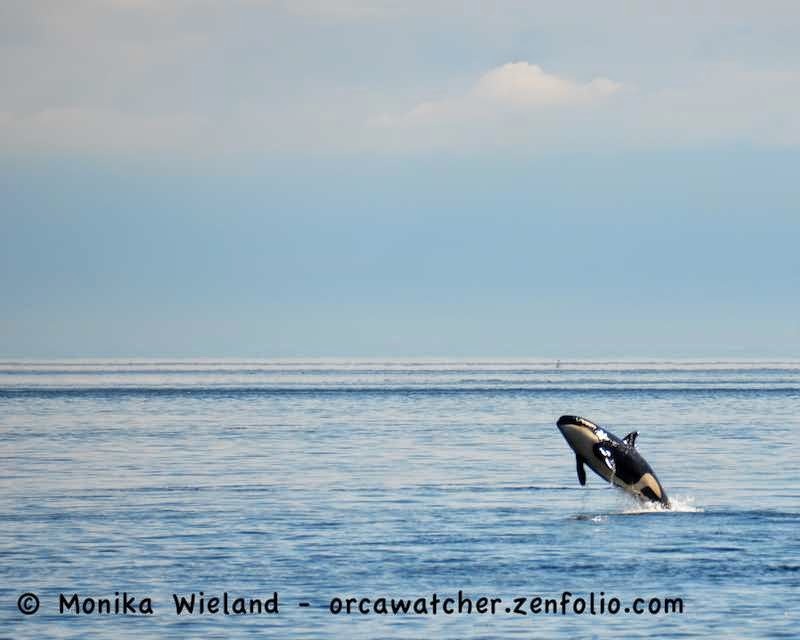 Between a busy week at work and lots of whales around, there's hardly been time to look at my photos, let alone blog! (Life is hard, I know!) 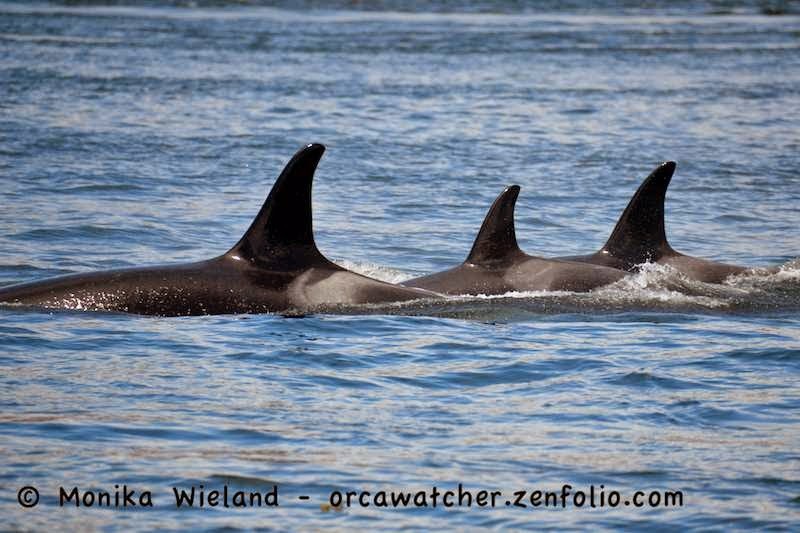 It's been fantastic to have J-Pod and about half of L-Pod around so much this month, especially compared to last year when sightings of the Southern Residents were few and far between. The fact that they're sticking around is a sure indicator that they're finding enough to eat, at least for now. 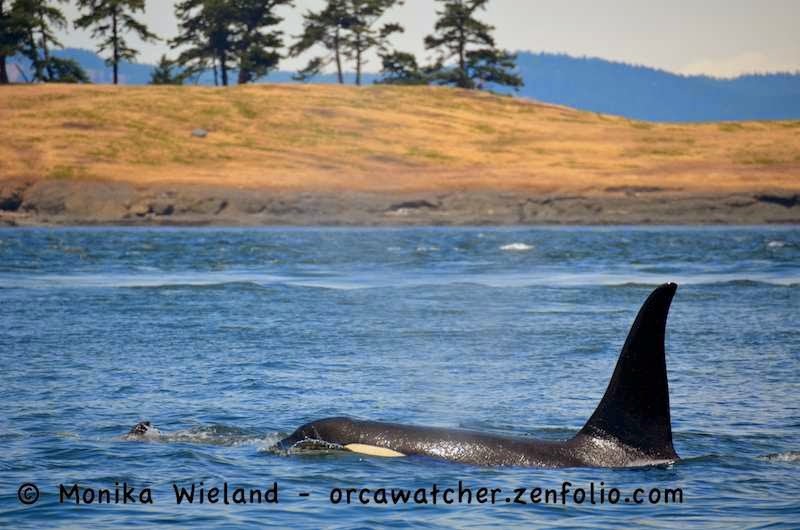 The whales have been making fairly typical rounds, making the journey up to the mouth of the Fraser River and back to the San Juans, or doing the famous "westside shuffle" on the west side of San Juan Island. On Tuesday, June 24th, however, they did something very unusual! 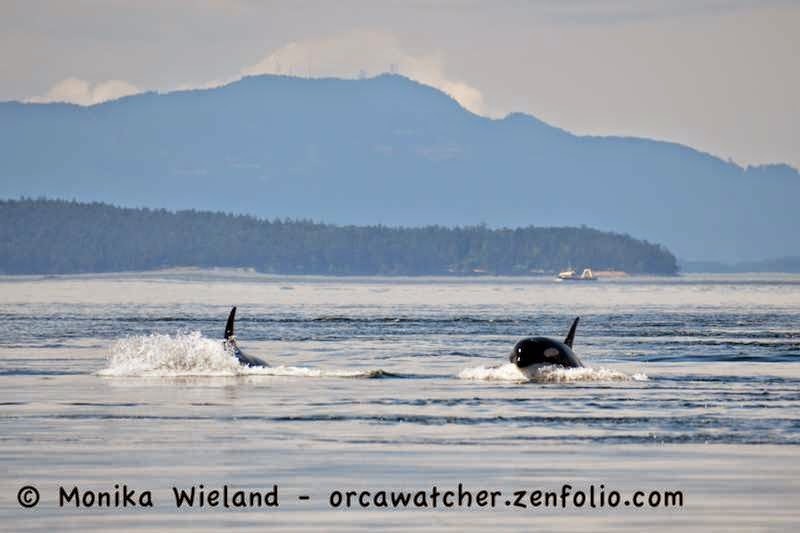 As they made their way south from the Vancouver area, it looked like they were going to take Rosario Strait south as they sometimes do. Then, they veered west and came down President's Channel. It looked like they were going to proceed south through San Juan Channel, but instead they made it part way down San Juan Channel, then did a U-Turn and headed back north up the channel. At about this point I was getting several frantic text messages from friends, because the whales were heading right for the little park by my house! Unfortunately I was in town and not at home - just getting off work and in the grocery store of all places! I jetted home as quickly as I could, but got to Reuben Tarte County park just as the whales were leaving. I could tell they had been really close to shore (unusual enough for them to be in San Juan Channel, but even more unusual for them to be close to shore there!). I was about ready to keel over in sadness at having missed them when they came to my neighborhood when I realized it looked like they were aiming for Spieden Channel. Thankfully I have a friend up there who has invited me to come watch whales from her property when it looks like they're heading that way, so I got up there just in time to see them! 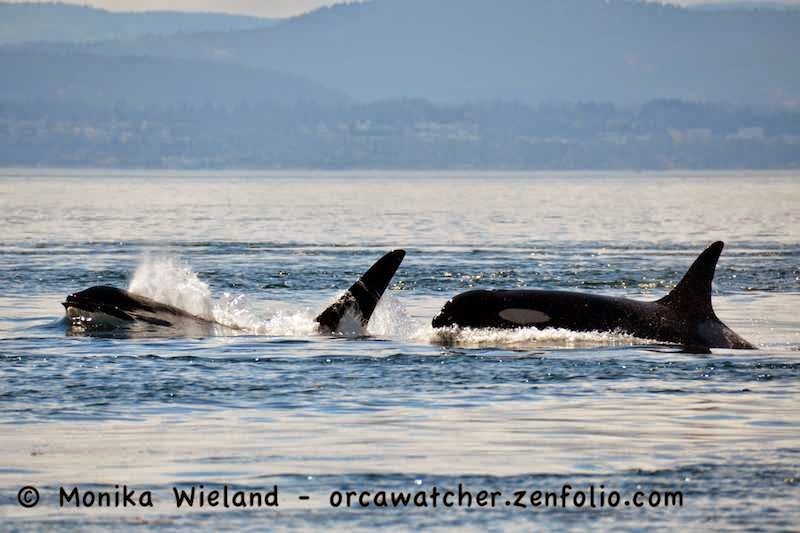 They were still close to shore, and it was an amazing encounter! My first shutter click of the passby - this cartwheeling whale! I haven't ever seen residents in Spieden Channel before, even though they maybe pass that way a couple times a year. I really never expected to see them so close to shore from there! 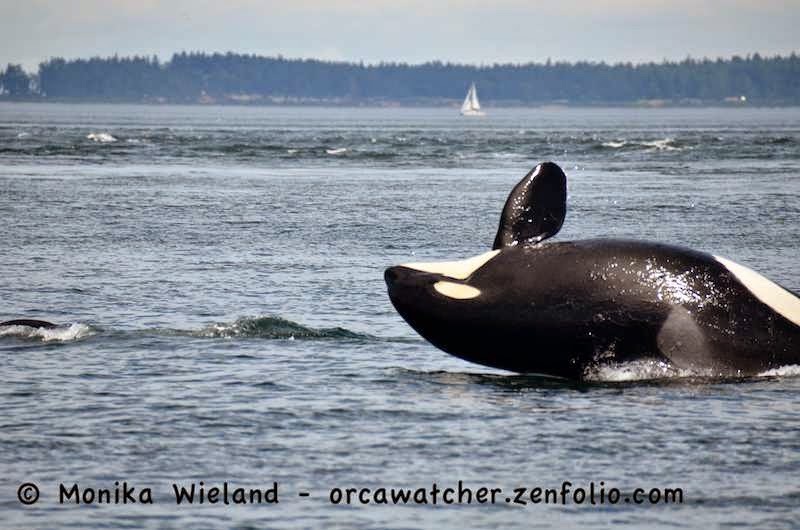 You have to put in a lot of time to see whales from shore, but when the stars align, often you end up much closer to the whales than boat-based whale watchers get to be. I've often been on a boat and seen people on shore, thinking, "They're so lucky right now!" On this day, I was one of those people the boaters were looking at! I love watching whales swim right towards me (who wouldn't? ), but it's usually a site I see from Lime Kiln. This was a totally new perspective! The yellow hillside of Spieden Island really made a nice back drop. This shot of L92 Crewser was one of my favorites of the day. As I watched the whales head west through Spieden Channel, it looked like they were going to angle out south into Haro Strait. So of course I was tempted to follow! 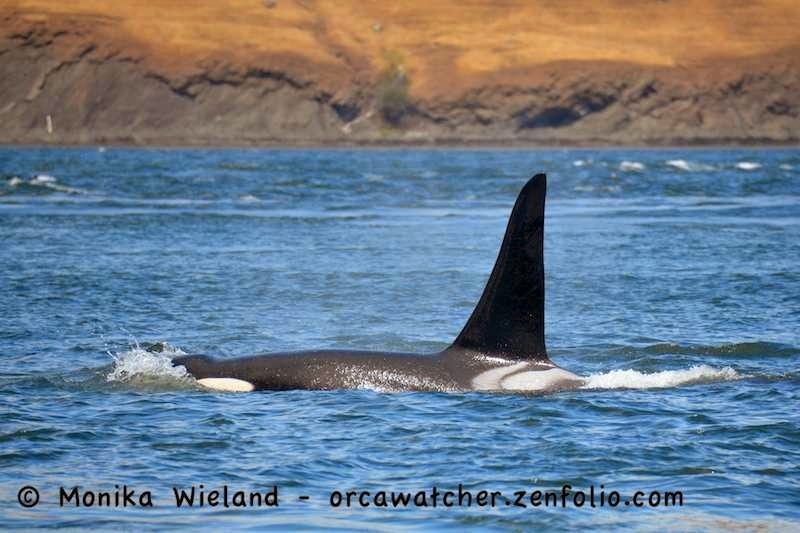 I went out to Lime Kiln, where I ended up meeting up with a bunch of other whale friends. 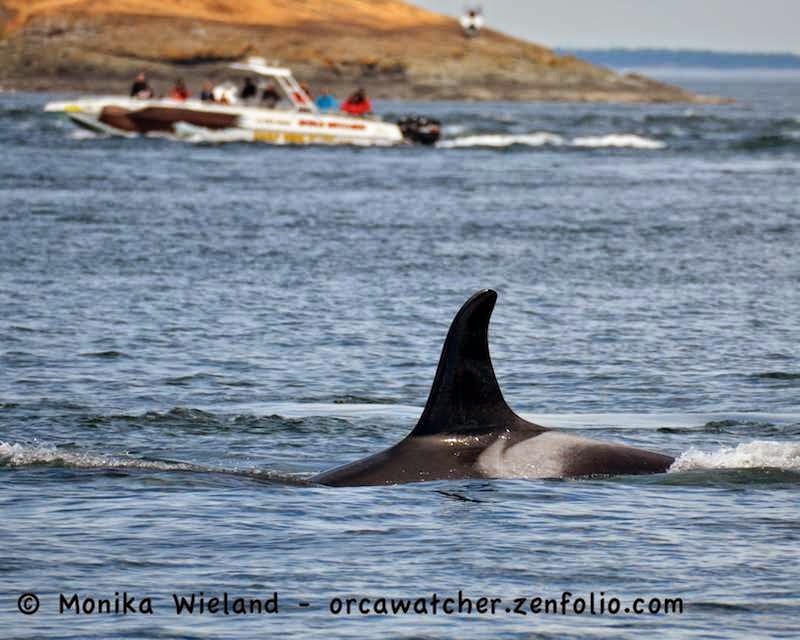 It was fun to watch whales with other "orcaholics" - some of them I've known for years, and some who I just met that day! As I was talking with my friends, we realized the people right next to us on the rocks were followers of our Facebook pages! 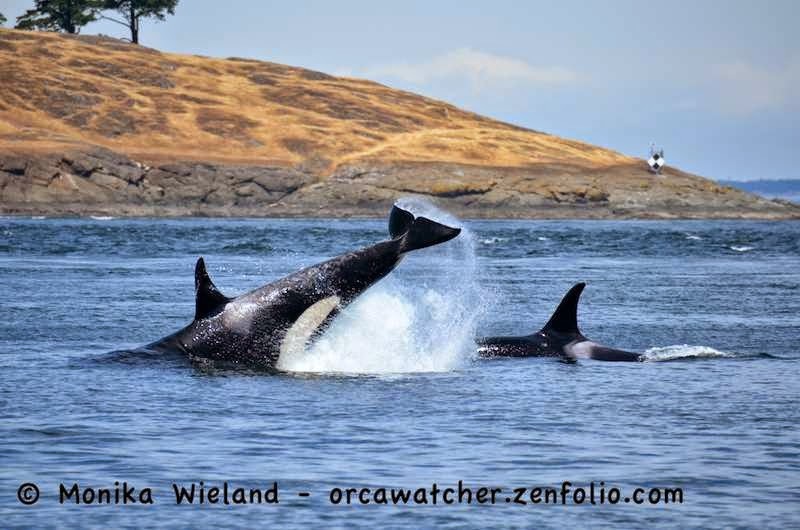 (Orca Watcher Photography on Facebook if you don't follow me there yet.) That's one of the coolest things about sharing my photos on social media - I've met some very neat people as a result! We had plenty of time to chat as groups of whales slowly meandered by. 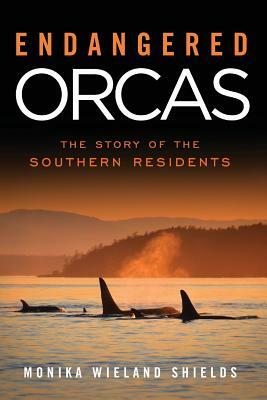 It wasn't just orcas, either. 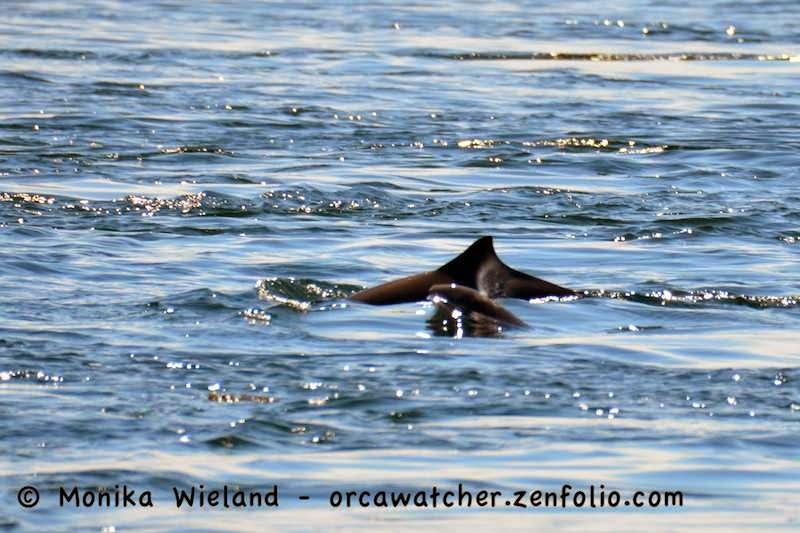 A couple of times groups of harbor porpoise came by pretty close to shore. This one had a calf with it! I've seen porpoise calves before, but never photographed one, until now. Despite shooting on rapid fire, this is the only shot I got of the little guy, he/she surfaces so quick! Look at that little blow!! You can only see it because the dark body of mom is right behind. 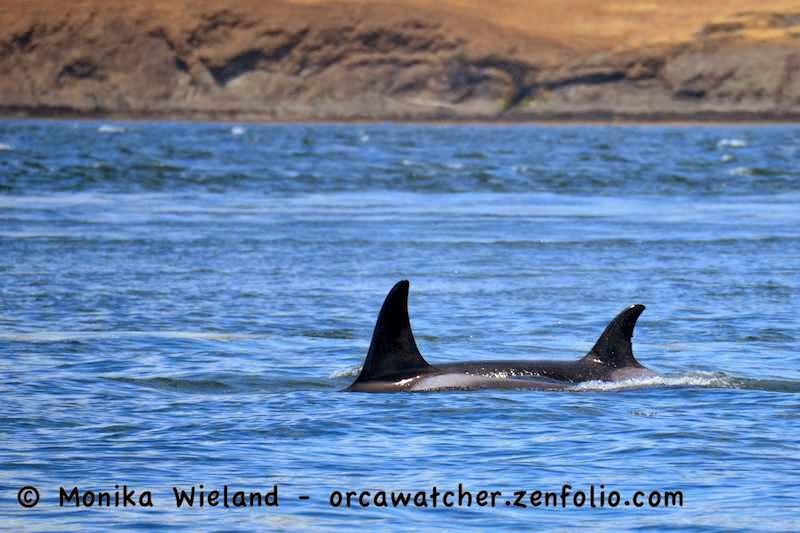 I was really lucky this week that shore-based whale watching dovetailed so nicely with a crazy week at work, so there were more J- and L-Pod sightings in store for me! My schedule all week was pretty much work, whales, sleep - not that I'm complaining in the least! So many more photos to come soon. 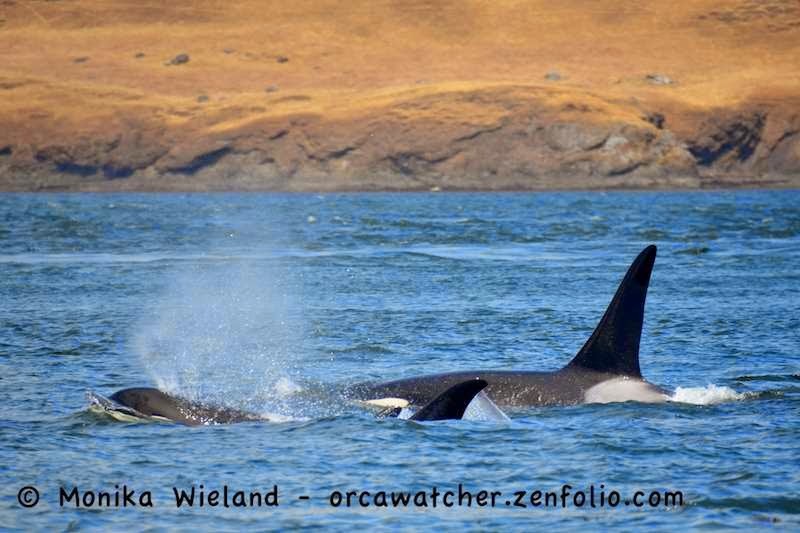 I am thrilled that you get to see the whales more this year than the last couple of years. Your excitement is contagious and your photos are as exceptional as usual. We were there too! Glad to know who it was I was photographing. I had purchased a whale identification book from the museum so I could do it myself, though I was a little nervous. Later that evening we watched them from our deck that overlooked the strait from Hannah Heights. It looked as though they were going back towards the park. We raced down there only to see them turn again back in the direction we had just come. We were lucky this trip... saw them everyday we were there. One day, we hope to call San Juan home... such paradise.